Howdy campers! I’m feeling Friday fine and dandy I have to say, with a big part of that being the contribution of the young players, who stepped up last night and put in a composed and controlled performance away to FC Vorskla. There will be those that will say that the level of opposition were not great. Indeed, this is true and you could see their technical skill level was below our players. Those same people will also say that the game didn’t mean much to Vorskla either, because they were practically out, confirmed on the night with the hammering Sporting dealt to Qarabag at the same time as our match was going on. Again, this also is true. And there will be those that say that the fact the stadium was half empty and it was played the other side of the country from where Vorskla actually play football probably had an impact. Perhaps. But to me all of that is inconsequential because what I saw was a group of very promising players dispatch a top flight (in their own league) side with consummate ease and on the night there were some of those players who looked like they’d been playing professional football for years. How many times have we seen an Arsenal team in Europe get through a group and then play the kids, only to show just how unprepared they were for the rigours of men’s football? I remember a 0-0 at home to Ajax at Highbury, I remember a couple of away defeats to Olympiakos, and I’m sure there are a few more that could be added to the list if I bothered to check the archives. So to see these players perform the way they did – regardless of the opposition – can only be a good thing for us. Unai went for a decent blend of youth and experience from the start too, which I think will have helped some of those young players, which meant recalls for Ramsey, Elneny, Cech, Lichtsteiner and Jenkinson. Oddly he deployed Jenkinson in the middle alongside Holding and despite the fact I’ve never personally seen The Corporal deployed there for Arsenal or any of the loans he’s had at other clubs, he dealt with everything pretty comfortably. He won headers when he needed to, tackles when he needed to, positionally seemed ok and the fact we managed a clean sheet would have been a pleasing sight for all of the back five last night. The midfield of Elneny and Guendouzi were relatively untroubled all night and because of that base it allowed Ramsey to roam across the pitch, always showing options and as you’d expect for a senior pro, he dominated proceedings at tines, having a hand in the penalty and also dispatching it well. It’s a shame that his Arsenal time appears to be petering out but I agree with the process. If we need him for regular action then he’ll be there but until then we need to keep seeing performances like that and us lot in the stands will be more than happy. Up top was interesting, as it was a very fresh-faced look to proceedings. 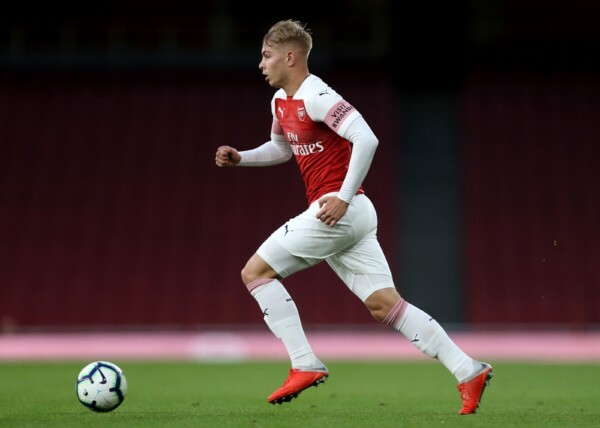 Smith-Rowe, Willock and Nketiah all started and each of them had an impact. Smith-Rowe bags a goal, Nketiah was heavily involved in the build up to that first, plus Willock scored a very, very impressive one I thought. As they said on commentary last night, it was very Thierry Henry-like and composure personified as he used the defender as a screen to curl the ball in the bottom right hand corner. We have some real talent emerging. This season we’ve seen it in Smith-Rowe, last season Maitland-Niles broke through, but we have other players who look like they’re certainly knocking on the door of being included in first team training each week and that can only be a good thing. There’s been questions over our academy in recent seasons but having seen some of the impressive performances last night, I can see why there are plenty of people excited about what this next batch of youngsters can do in terms of first team contributions. The victory seals top spot and that’s important, but it also means that those players will have earned another start in a couple of weeks time against Qarabag. That’s just as well because with the games coming thick and fast now it does feel as though Emery will need to use the full breadth of his resources to ensure we don’t suffer fatigue problems. What’s more, we have rested practically the whole team for Sunday, which one hopes is an advantage for the North London Derby.